Yesterday was game day here in Starkville! With it being a Thursday a.k.a. a business day, the university let us have the afternoon off! How nice huh? It was actually because they needed our very coveted parking spaces. But hey, a free half day off, who would complain? Since Mike did not get a free half day we decided that being able to make it to the game on time would be pretty impossible so we decided to stay home and have our own little tailgate! I personally like this option because it allowed me to wear pj’s! 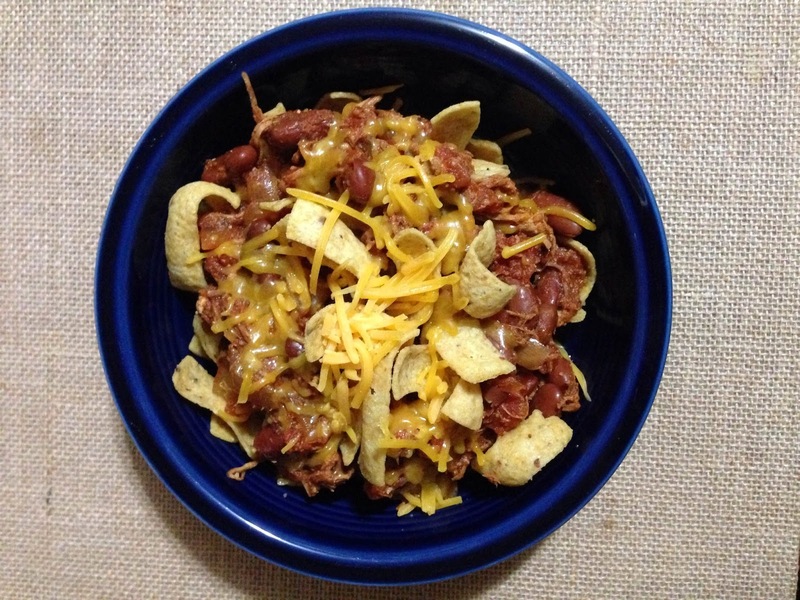 Anyway, there are a TON of Frito Pie recipes on the web but all I did was make my regular chili recipe(below) and then added to it some Frito’s in the bottom of a bowl and topped it with fun toppings. I used a rotisserie chicken(from the grocery store) and chopped up the meat to use in the recipe. This will save you a ton of time as you do not have to precook anything before you assemble it in the crock-pot! We love chicken chili even though I know some people will think this is blasphemy but it’s much healthier than using red meat and it’s still delish. I hope you enjoy this simple recipe with the bonus being that you come home from a long day to a home smelling of warm chili on a cool fall day! Enjoy! If you are using raw meat you need to add the oil to a pan and brown it with half of the onion until done and drain. Add ALL ingredients to a 4-6qt. slow cooker and mix thoroughly. Set the slow cooker to the LOW setting and forget about it for 8-10 hours. In a chili bowl, put a layer of Frito’s corn chips in the bottom.